You're marrying the man of your dreams. Thank your future in-laws for raising such a wonderful son. 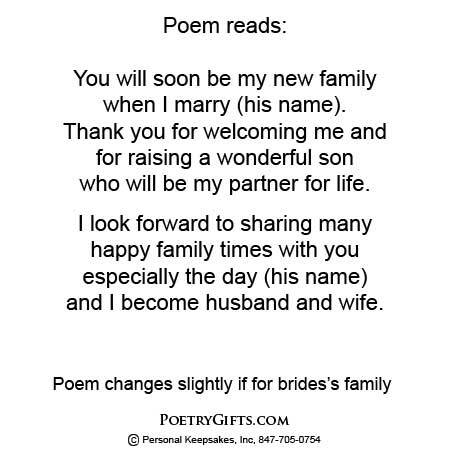 This heartfelt, personalized poem let's your mother-in-law and/or father-in-law know you are excited about becoming a part of their family. Frame it yourself or we can do it for you. Makes a wonderful gift for in-laws on your wedding day. 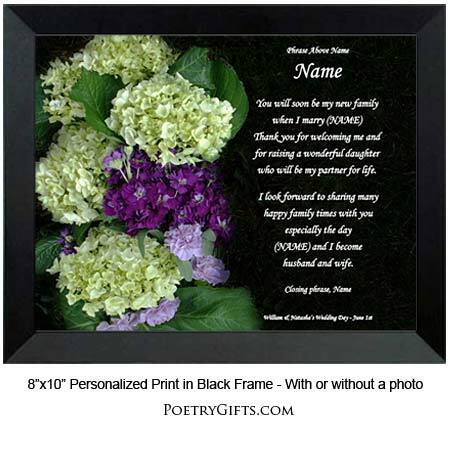 Do you need a gift idea for your in-laws...A meaningful and lasting "Thank You"present...Something that will let them know how much you are looking forward to all of the wonderful times you will share as a family? Our "Thank You to My In-Laws" Poetry Gift IS that gift! 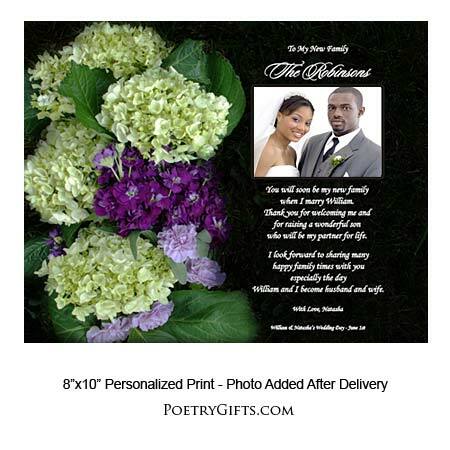 The striking hydrangea design is beautiful, the personalized poem is original, AND there's a cut-out photo area for a favorite wedding photo of the bride and groom. 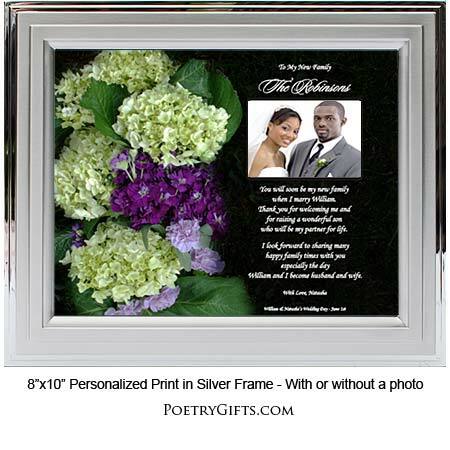 (Photo can be easily inserted after the wedding) Remember your groom's mom and/or dad with this thoughtful keepsake. He'll love you all the more! 4. Optional Phrase and Wedding Date - (Example: Beth & Ken's Wedding Day - June 15th ; Joe & Melissa's Wedding Day; October 5th ; etc.)" when I marry (his name). who will be my partner for life. and I become husband and wife.